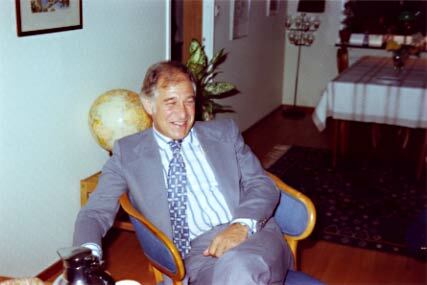 Torvard C. Laurent was born in 1930 in Stockholm, Sweden, and pursued his medical education at the Karolinska Institute, where he received an M.D. in 1958. He started research training in 1949 with Endre A. Balazs and later Bertil Jacobson as teachers and defended his Ph.D. thesis,Physico-chemical Studies on Hyaluronic Acid, in 1957. Laurent held positions as Instructor in Histology and Chemistry at the Karolinska Institute in the 1950s, was Research Fellow and Research Associate at the Retina Foundation in Boston, MA, for 4 years and came to Uppsala University in Sweden in 1961 as Associate Professor. He held the chair in Medical and Physiological Chemistry at the same university 1966-96 and is now active as Emeritus Professor. For more than 50 years, Dr. Laurent has contributed to the physico-chemical characterization of hyaluronan and to the elucidation of its physiological functions, its catabolism and its behavior in pathological conditions. He built a school of connective tissue biology in Uppsala, and many of his students are now carrying on the work he initiated. Dr. Laurent has also been entrusted with various administrative tasks within academia. 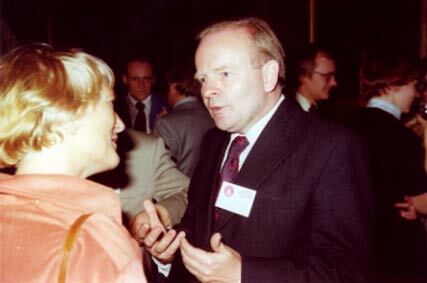 Among the more recent are the Presidency of The Royal Swedish Academy of Sciences (1991-94), membership on the Nobel Committee of Chemistry (1992-2000), and the positions of Chairman of the Board of Trustees of the Nobel Foundation (1994-2001) and Science Secretary of the Wenner-Gren Foundations (1993-2002). *Because of the great number of references alluded to in this history, the reader is referred to previous review articles by the author (Refs. 111) as well as to the excellent contributions to this website, Science of Hyaluronan Today. This article is based on a lecture given at the conference "Hyaluronan 2000" in Wales in September 2000. All research grows from previous knowledge. The roots of our tree are anchored primarily in carbohydrate chemistry, connective tissue biology and polymer science. Hyaluronan is a carbohydrate! In the 19th century, carbohydrates were believed to be hydrates of carbon, with the general formula Cn(H2O)n. About a century ago, it was realized that derivatives of the original carbohydrates did exist; these were included in the carbohydrate (monosaccharide) family. The terms "polymer" and "macromolecule" were defined in the early 20th century when new techniques were introduced to determine molecular weight. Polymers built from a large number of monosaccharides were called polysaccharides. When stains to color histological sections were developed in the 19th century, it was shown that tissues of mesenchymal origin (connective tissues) often contained an extracellular amorphous "ground substance," which stained with basic dyes. Mucoids, which contained a carbohydrate, were extracted from the ground substance. In 1889 Mörner extracted a mucoid from cartilage, which contained carbohydrate, later defined as the polysaccharide chondroitin sulfate. A related compound, heparin, was discovered as an anticoagulant by McLean in 1916 and subsequently characterized as a carbohydrate by Howell. Interestingly, in 1918 Levene and López-Suárez isolated a polysaccharide containing glucosamine, glucuronic acid and sulfate, which they named mucoitin sulfuric acid. It was probably hyaluronan but incorrectly assumed to contain sulfate. Preceding the discovery of hyaluronan, Duran-Reynals (1929) described a biological activity in testis, which he called "spreading factor." When injected together with India ink in dermis, it increased the spreading of ink particles in the tissue. This factor was subsequently shown to be the enzyme hyaluronidase, which degrades the hyaluronan in skin. The trunk of basic knowledge contains the discovery, isolation, localization, chemical characterization and analysis of hyaluronan. In 1934, Karl Meyer (Fig. 2) and John Palmer, working in the Biochemical Laboratory of the Department of Ophthalmology at Columbia University, described a new polysaccharide isolated from bovine vitreous humor. It contained uronic acid and hexosamine. They named the polysaccharide "hyaluronic acid" from hyaloid (vitreous) + uronic acid. It was first isolated as an acid, but at physiological conditions it behaved like a salt (sodium hyaluronate). The term "hyaluronan" was introduced in 1986 to conform with the international nomenclature of polysaccharides. 次Within the next decade, Meyer and others isolated hyaluronan from joint fluid, skin, umbilical cord, rooster comb, etc. Of special interest was the discovery by Kendall, Heidelberger and Dawson (1937) that the capsule polysaccharide of a group A hemolytic Streptococcus strain was identical to hyaluronan. The original preparation procedures for hyaluronan included removal of proteins by denaturation or proteolytic digestion and then fractional precipitation of the polysaccharides with alcohol or acetone. An important improvement was introduced by John Scott (Fig. 3) when he developed fractional precipitation with a cationic detergent (cetylpyridinium chloride) at varying salt concentrations. More sophisticated techniques, such as electrophoresis and chromatography, are often applied for separation on smaller scales. The chemical structure of hyaluronan was essentially solved by Karl Meyer and his associates in the 1950s. They used hyaluronidases to produce overlapping oligosaccharides, each of which could be structurally analyzed by conventional techniques. John Scott. Is he trying to convince Mrs. Anseth to use cetylpyridinium chloride or Alcian blue? Picture taken in 1977. The basic unit of hyaluronan is a disaccharide consisting of D-glucuronic acid and N-acetyl-D-glucosamine linked by a glucuronidic β (1-3) bond. The disaccharide units are then linearly polymerized by hexosaminidic β(1-4) linkages (Fig. 4). In the beginning, the only way of analyzing hyaluronan quantitatively was to isolate the polymer in pure form and weigh it or measure its monosaccharide constituents. Uronic acid was determined by Dische's carbazole technique and hexosamine by the Elson-Morgan reaction (Zacharias Dische, see Fig. 5). The analyses required milligram quantities. The next step came in 1970 with the introduction of a specific enzyme that could degrade hyaluronan to a defined product, which could be measured in the presence of other polysaccharides and other impurities. The enzymatic technique increased the sensitivity to microgram quantities. Ten years later Tengblad (Fig. 6) designed a technique based on proteins with specific affinity to hyaluronan (hyaladherins). These proteins could be used as "antibodies" in an assay analogous to an immunoassay. The new technique allowed direct analysis of hyaluronan in tissue fluids in nanogram quantities. 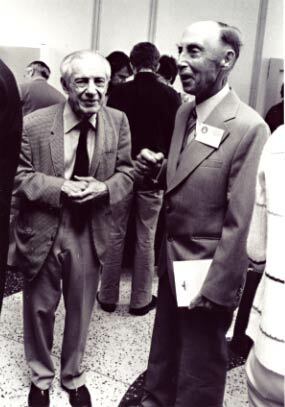 Zacharias Dische (left), who designed the carbazole method to determine uronic acid - an indispensable technique in the history of hyaluronan research - and Gunnar Blix (right) - a pioneer in glycobiology, who discovered sialic acid. Picture taken in 1977. 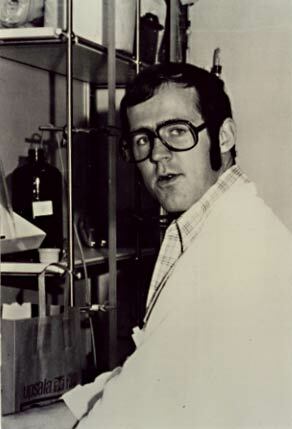 Anders Tengblad, who designed the first radioassay for hyaluronan and thereby made it possible to determine hyaluronan in blood serum and other clinical material. Picture taken in 1981. New techniques to visualize hyaluronan in histological sections have been developed in parallel with new techniques for quantitative analyses. From the beginning, unspecific staining with a basic dye, e.g. toluidine blue, was used. In the 1960s, based on his experience of fractionating polyanions in detergents, John Scott increased the specificity of staining with Alcian blue. By varying the salt concentrations, he could differentiate between differently charged polysaccharides. Then in 1985 the first reports were published on specific localization of hyaluronan with the use of affinity proteins. The latter technique has now been used for detailed localization of hyaluronan in tissues. An ingenious technique for visualizing pericellular hyaluronan was described by Clarris and Fraser in 1968 (Robert Fraser, see Fig. 7). When they added a suspension of particles to a culture of fibroblasts, the particles were excluded from the immediate environment of the cells. This exclusion was abolished by hyaluronidase and thus due to hyaluronan. The method of Clarris and Fraser has been very useful in biological experiments on cell/hyaluronan interactions. 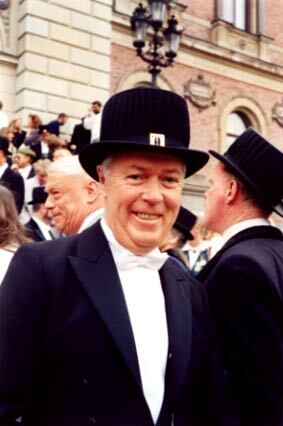 Robert Fraser when he received an honorary degree in medicine at the University of Uppsala in 1988 for his pioneering work on the turnover of hyaluronan. Hyaluronan has also been visualized by electron microscopy. The first interpretable study was made by Fessler and Fessler in 1966. They could see linear extended chains with a length corresponding to what would be expected from the average molecular weight of the preparation. The molecular anatomy also includes the fine structure of the linear chain - the conformation. The first attempts to determine the conformation were made by X-ray crystallographers from fiber diagrams 30 years ago. A breakthrough was made by John Scott (Fig. 3) in 1978, when he suggested that intra-chain hydrogen bonds were responsible for the decreased sensitivity of hyaluronan to periodate oxidation. Ten years later, this finding was verified by nuclear magnetic resonance analysis, and the conformation could be accommodated in the two-fold helical structure described by Atkins in 1972. The macromolecular characterization of hyaluronan started 50 years ago and was pursued during a 10-year period by mainly three research groups, A.G. Ogston in Oxford (Fig. 8), Endre Balazs in Boston (Fig. 9) and Torvard Laurent in Stockholm. In the beginning a main problem concerned the purification of the native polysaccharide without degradation or other modifications. Ogston used ultrafiltration to isolate hyaluronan from joint fluid and obtained a preparation containing 30% protein; other investigators used various physical, chemical and enzymatic means, which removed proteins down to a few percent. However, the general results of the physical chemical analyses gave a consistent picture of the hyaluronan molecule. The molecular weight was usually several millions, although many samples were polydisperse. Light-scattering showed that a molecule of 3-4 million in molecular weight behaved as a randomly coiled, relatively stiff, chain molecule, with a radius of gyration on the order of 200 nm. The chain stiffness is due to the intra-chain hydrogen bonds mentioned above. The random coil structure was consistent with viscosity data. Ogston, using sedimentation, diffusion and rheological data, concluded that the molecule behaved like a large hydrated sphere, which is compatible with a random coil configuration. 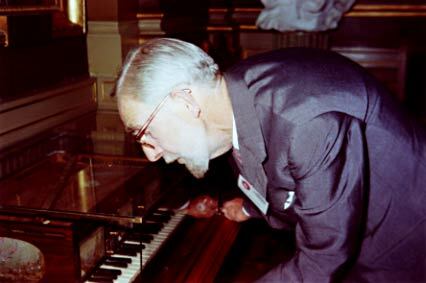 Alexander G. (Sandy) Ogston - the pioneer of physical chemical studies of hyaluronan - admiring a musical instrument in Uppsala in 1977. He received an honorary degree in Uppsala that year. Endre A. (Bandi) Balazs, who pioneered the medical use of hyaluronan. The picture was taken in the home of the author in 1977. Balazs received an honorary degree in medicine in Uppsala in 1967. From the dimensions of the largest hyaluronan molecules, one can estimate that they should fill the solution completely at concentrations on the order of 1 g/l. At higher concentrations, the molecules will become entangled, and the solution will consist of a continuous network of chains. The entanglement point is clearly visible as a point where the specific viscosity increases dramatically when the concentration is further increased. However, not only mechanical entanglement but also chemical chain-chain interaction (cross-links) could stabilize the network. 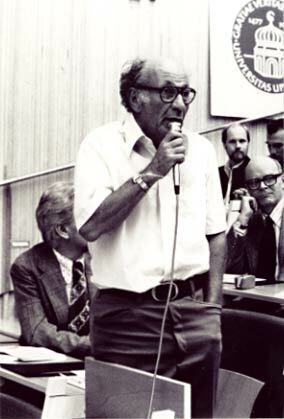 Ogston suggested that proteins could act as cross-links, and data from the group of Dai Rees (1980) gave evidence for a hyaluronan-hyaluronan interaction. In the work by Scott 10 years later on the conformation of hyaluronan, it became clear that the hyaluronan chain displays hydrophobic patches, which through hydrophobic interaction can join two or more hyaluronan chains. The solutions containing hyaluronan networks show remarkable rheological properties - very high viscosities, elasticity, and strong shear-dependence. These properties are complex functions of the molecular weight and concentration of the polysaccharide. That is, the viscosity of a 1% solution of hyaluronan of 4 million molecular weight has a viscosity relative to water at zero shear rate of approximately 400,000. At a high shear rate (1000 s-1) the viscosity drops to 1% of that value. In an oscillating rheometer, the solution is mainly elastic at high frequencies and viscous at low frequencies. The first studies of shear dependence of pure hyaluronan solutions were made by Ogston (1951) and of elasticity by Jensen and Koefoed (1954). The discovery that hyaluronan chains entangle at concentrations that may occur in many tissues raised the hypothesis that hyaluronan actually exercises its physiological activity via the properties of a continuous three-dimensional chain network. These ideas were examined during the 1960s in the laboratories of Laurent and Ogston. Quite naturally, the rheological properties were connected with lubrication, especially since hyaluronan always seems to be present in spaces separating mobile tissues, e.g., in joints and between muscles. Other properties could be connected with fluid balance. The osmotic pressure of a hyaluronan solution is strongly concentration dependent, and the polymer can therefore act as an osmotic buffer regulating the extracellular water content. Furthermore, it can be shown that a hyaluronan network exerts a high resistance towards water flow and that it therefore can form flow barriers in the tissue. The network also forms a diffusion barrier for other molecules. The movements of macromolecules and particles become hindered in the network, whereas low-molecular-weight compounds can penetrate with relative ease. These barriers may have biological significance. For example, the pericellular layer of hyaluronan around fibroblasts could protect the cells from interaction with other macromolecules and cells. The network also mechanically excludes space for other macromolecules (the same kind of exclusion as in gel chromatography) and can thereby regulate the concentration of various proteins in the tissues. The exclusion effect has been discussed in connection with protein partition between the vascular space and extracellular tissue space and also as a driving force in physiological or pathological deposition of proteins in the tissues. Until 1972 it was believed that hyaluronan was an inert compound in the tissues that did not specifically interact with other macromolecules. In that year Hardingham and Muir (Fig. 10) showed that hyaluronan can aggregate cartilage proteoglycans. Thorough studies by Hascall (Fig. 10) and Heinegård (1974) documented that there is a specific binding between hyaluronan, the N-terminal globular part of the proteoglycan and a link protein. This is a firm association, and many proteoglycans bind to the same hyaluronan chain, forming large aggregates in cartilage and other tissues. Thus hyaluronan is a component of supermolecular structures. The discovery that hyaluronan aggregates cartilage proteoglycans was a turning point in hyaluronan research. 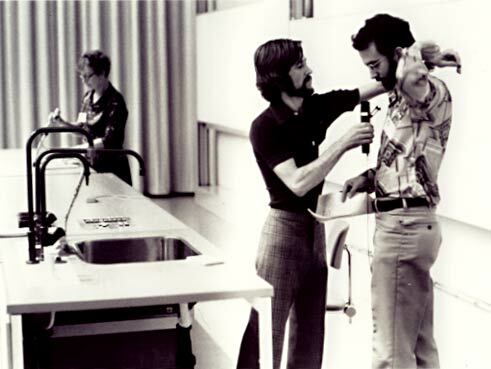 The picture, taken at a session on proteoglycans in 1977, shows three of the pioneers in the field: Helen Muir, Tim Hardingham and Vincent Hascall. Also in 1972 Pessac and Defendi and Wasteson et al. demonstrated that certain cells in suspension aggregate when hyaluronan is added. This was the first report that hyaluronan interacts specifically with cell surfaces. Underhill and Toole (1979) (Bryan Toole, see Fig. 11) described how hyaluronan actually binds to cells, and the responsible "receptor" was purified in 1985. Four years later, two groups identified the lymphocyte homing receptor, CD44, as a hyaluronan binding protein and subsequently the receptor of Underhill and Toole was shown to be CD44. Other cell surface proteins recognizing hyaluronan have since been described (e.g., RHAMM [receptor for hyaluronan mediated motility], the liver endothelial cell receptor, LYVE-1 [lymphatic vessel endothelial hyaluronan receptor-1] and laylin). Proteins interacting with hyaluronan have been named hyaladherins. 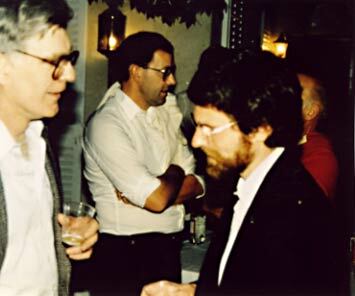 Bryan Toole (left) initiated work on the biological function of hyaluronan and hyaladherins. Bård Smedsrød (right) discovered that liver endothelial cells scavenge hyaluronan. Picture taken in St. Tropez in 1985. Until the discovery of hyaladherins, hyaluronan was thought to influence cell behavior entirely through physical interactions. Evidence that hyaluronan might play a role in biological processes was purely circumstantial and to a large extent built upon the presence or absence of hyaluronan in biological processes. Much of the speculations were based on unspecific histologic investigations. A very successful research line started in Boston in the beginning of the 1970s. Bryan Toole (Fig. 11) and Jerome Gross showed that during regeneration of the newt limb hyaluronan was first synthesized and subsequently removed by hyaluronidase, when instead chondroitin sulfate was formed. A similar pattern was seen in the developing chick cornea. Toole pointed out that accumulation of hyaluronan coincided with periods of cellular migration in the tissues. This is a very common pattern and is also seen in wound healing. With the discovery of hyaluronan receptors, we have a much firmer basis for the concept that hyaluronan plays a role in regulating cellular activity, e.g., motility. A large number of reports have also been published in the last decade on the role of hyaluronan and hyaluronan receptors in cellular migration, mitosis, inflammation, cancer, angiogenesis, fertilization, and so on. Research on the biosynthesis of hyaluronan has gone through three phases. The dominating person in the first phase was Albert Dorfman (Fig. 12). During the early 1950s, he and his collaborators described the origin of the monosaccharides to be incorporated into the hyaluronan chain in streptococci. However, it was Glaser and Brown in 1955 who, for the first time, demonstrated hyaluronan synthesis in a cell-free system. They used a particulate enzyme from Rous chicken sarcoma that incorporated 14C-labeled UDP-glucuronic acid into hyaluronan oligosaccharides. The Dorfman group subsequently isolated the precursors UDP-glucuronic acid and UDP-N-acetyl glucosamine from extracts of streptococci and synthesized hyaluronan with a streptococcal enzyme fraction. 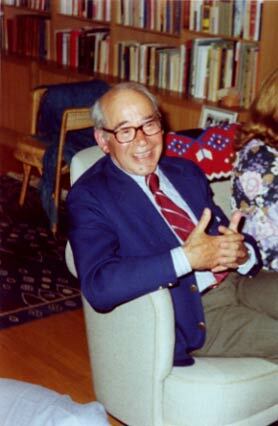 Albert Dorfman headed the group in Chicago, that started research on the biosynthesis of hyaluronan in the 1950s. The picture was taken in 1977. In the second phase it became apparent that hyaluronan must be synthesized by a different mechanism than for other glycosaminoglycans. Hyaluronan production did not require an active protein synthesis, in contrast to sulfated polysaccharides, as it was not part of a proteoglycan. The synthase was located in the protoplast membrane of bacteria and the plasma membrane of eukaryotic cells and not in the Golgi. The synthesizing machinery was presumably located on the internal side of the membrane, as it was insensitive to external proteases, but the hyaluronan chain was apparently extruding through the membrane since extracellular hyaluronidase treatment enhanced hyaluronan synthesis. Finally, in contrast to sulfated glycosaminoglycans, hyaluronan chains were synthesized by monosaccharide additions to the reducing end. A few unsuccessful attempts to isolate the synthase from eukaryotic cells were made in the 1980s. In the early 1990s it was realized that hyaluronan synthase was a virulence factor for group A streptococci, and using this information two groups (Dougherty and van de Rijn, and DeAngelis et al.) defined a gene locus responsible for the production of the hyaluronan capsule. Soon the synthase was cloned and its sequence determined. Homologous vertebrate enzymes were discovered, and a wealth of information has accumulated in only a few years. An important field for future research will be the mechanism by which the activity of the synthase is regulated. In 1981 it was discovered that hyaluronan is present in normal blood and that it is carried from peripheral tissues to the circulation by lymph. This started a collaborative investigation between Robert Fraser in Melbourne (Fig. 7) and Torvard Laurent in Uppsala on the turnover of hyaluronan. Trace amounts of the polysaccharide labeled with tritium in the acetyl group were injected in the circulation of rabbits and humans, and the label disappeared with a half-life of a few minutes. It was soon realized that the major part of the radioactivity had been taken up by the liver, where the polymer was rapidly degraded. Autoradiography revealed that uptake also occurred in spleen, lymph nodes and bone marrow. Through cell fractionation it could be demonstrated that the cells responsible in the liver were the sinusoidal endothelial cells, and this was confirmed by uptake studies in vitro and by in situ autoradiography. These cells carry a receptor for endocytosis of hyaluronan which is very different from other hyaluronan-binding proteins. The polysaccharide is degraded in lysosomes. An important contribution to the description of the scavenging of hyaluronan by liver endothelial cells was made by Bård Smedsrød (Fig. 11). Studies on hyaluronan catabolism were also extended to other tissues, and we now have a fair view of the general turnover of the polysaccharide in the organism. Another aspect of hyaluronan degradation has gained recent attention. Through the work of Günther Kreil in Austria and Robert Stern and associates in San Francisco, the structure and properties of various hyaluronidases have been described, which has led to interesting observations on the biological roles of these enzymes. A special aspect of the metabolism of hyaluronan concerns pathological conditions. We have known for a long time that in certain inflammatory conditions such as arthritis there may be an overproduction of hyaluronan in the joints. An overproduction was also found in some malignant diseases, e.g., mesothelioma. However, it was not until the new analytical tools for hyaluronan were developed in the 1980s that it became clinically interesting to study variations in hyaluronan levels. The normal concentration in blood was determined, and pathological levels were noted, especially in liver cirrhosis, when hyaluronan could not be degraded in the liver. In rheumatoid arthritis, the blood level rose during physical activities in the morning, giving an explanation to the symptom "morning stiffness." High levels were found both locally and in blood during various other inflammatory diseases. Organ dysfunctions could be explained by local accumulation of hyaluronan followed by interstitial edemas. The original development of hyaluronan as a product to be used in clinical medicine is entirely due to Endre Balazs (Fig. 9). He derived the main concepts, he was the first to prepare hyaluronan samples that were tolerated, he promoted the industrial production of hyaluronan, and he popularized the use of the polysaccharide. During the 1950s Balazs concentrated his research on the composition of the vitreous body and started to experiment with vitreous substitutes to be used in surgery of retinal detachment. One of the crucial obstacles for using hyaluronan in implants was to prepare hyaluronan free of impurities that could cause inflammatory reactions. Balazs solved this problem, and his final preparation was called NIF-NaHA (noninflammatory fraction of sodium hyaluronate). In 1970 Rydell and Balazs injected hyaluronan in the arthritic joints of racehorses with a dramatic positive effect on the clinical symptoms. Two years later, Balazs convinced Pharmacia AB in Uppsala to start production of hyaluronan for veterinary and human use. Ten years later, Miller and Stegman, following the advice of Balazs, started to use hyaluronan as a device in the implantation of plastic intraocular lenses, and hyaluronan became a major product for ophthalmic surgery under the trade name of Healon®. Numerous other applications have since been suggested and tested. Derivatives of hyaluronan, e.g. cross-linked samples, have been used clinically. Among the various fields of applications can be mentioned other visco-surgical procedures than eye surgery; various tissue implants, e.g., in skin for cosmetic purposes or in flaccid vocal cords to improve the voice; to prevent adhesions and improve wound healing; to encapsulate cells for implantation; to act as a drug carrier; and to be used as a tool in cell separations, e.g., sperm isolation. Numerous other applications have been proposed. It has been a privilege to climb the tree for more than 50 years and to follow how new twigs have started to grow out of the trunk, and then, if they have caught the sunshine and received the right nutrients, to grow into strong branches from which new twigs are coming. Other branches are placed in the shade and stop growing. It is many times very difficult to predict in what direction the tree will grow. Our hyaluronan tree is of course also dependent on other trees in the forest that compete for space and nutrients but which also can protect from storms. In spite of the uncertainty of the future, I will look out from the top of the tree and make a guess in which direction research will lead us. I have placed clinical use in the crown because I believe that the economic incentives will supply resources to develop new applications of this versatile polysaccharide in medicine and perhaps also in other fields. It is easy to predict that hyaluronan will be increasingly used in new types of viscosurgery and tissue implants. So far these techniques have not taken into account our growing knowledge of hyaluronan-binding proteins on cell surfaces. With a more detailed knowledge of the interaction of individual cells with the hyaluronan matrix, it will be possible to make tissue implants custom-made. We can call this matrix engineering. Also, it is easy to predict that encapsulation of cell transplants in hyaluronan will be tried. With increasing knowledge of hyaladherins, one can also predict that hyaluronan will be used for techniques utilizing receptor-ligand interactions, e.g., as a tool in cell separations, in drug targeting and perhaps in protection of cells. Other clinical applications are based on our increasing knowledge of the behavior of hyaluronan in pathological conditions. Can we prevent deleterious edema due to hyaluronan accumulation? Can we increase the use of hyaluronan assays in clinical diagnosis? If we look for other branches of the tree aside from the branch of immediate clinical applications, there are two which at present have a strong growth potential, since they may contain the key information to our understanding of hyaluronan biology. First, our expanding knowledge of the hyaluronan synthases and hyaluronidases and their regulation will make it possible to up- and downregulate hyaluronan production in such biological systems as development, wound healing and malignancies. Second, our growing knowledge of hyaluronan receptors and their interactions with intracellular components will give us an insight into their functions and thereby the function of hyaluronan.